Washington sophomore Tabby Woods takes the ball to the basket during an SCOL game against Hillsboro at Washington High School Wednesday, Jan. 25, 2017. 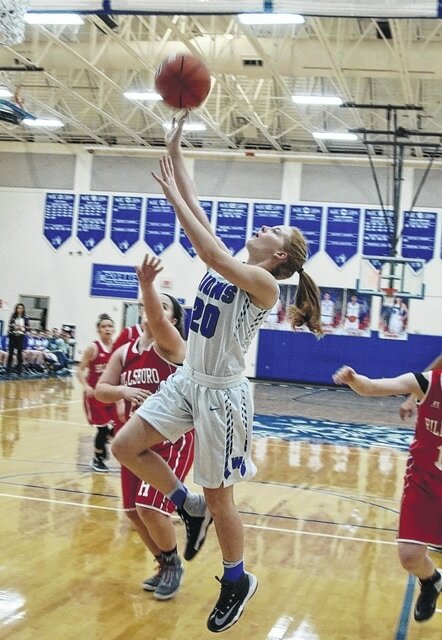 On Wednesday, Jan. 25, the Washington Lady Blue Lion basketball team entertained the Lady Indians of Hillsboro. Washington won this game, 60-38 to improve to 5-6 in the SCOL, 7-9 overall at that time. Washington sophomore Hannah Haithcock was the game’s leading scorer with 24 points. Freshman Rayana Burns scored 10, sophomore Bre Taylor had eight points, including two three-point field goals; freshman Shawna Conger scored seven points (hitting one three), senior Savannah Wallace scored six points and sophomore Kassidy Hines had five points (including one three). Hillsboro had nine players reach the scoring column, led by Kayden Watson and Kaley Burns, each with six points. The Lady Lions jumped out with an explosive first quarter, scoring 25 points to 9 for Hillsboro. By the time the game had reached the half, the Lady Lions were in front, 36-15. Hillsboro had its best scoring quarter of the game in the third, tallying 13 points. But the Lady Lions scored 16 to lead 52-28 after three quarters of play. Washington will be back in action Monday at home against North Adams. WASHINGTON — Rayana Burns 5-0-10; Maddy Garrison 0-0-0; Bre Taylor 1 (2)-0-8; Kassidy Hines 0 (1)-2-5; Savannah Wallace 3-0-6; Savanna Davis 0-0-0; Tabby Woods 0-0-0; Shawna Conger 2 (1)-0-7; Maddy Jenkins 0-0-0; Hannah Haithcock 11-2-24. TOTALS — 22 (4)-4-60. Free throw shooting: 4 of 4 for 100 percent. Three-point field goals: Taylor, 2; Hines, Conger. HILLSBORO — Kayden Watson 1-4-6; Sydney Bobbit 1-1-3; Kelsey Burns 0 (1)-1-4; Kira Watson 0-0-0; Josie Hopkins 1-1-3; Lana Grover 0 (1)-03; Karleigh Hopkins 2-0-4; Madi Marsh 0-0-0; Riley Moberly 0 (1)-2-5; Jordan Moberly 0-0-0; Taylor Chaney 1-2-4; Kaley Burns 3-0-6. TOTALS — 8 (3)-11-38. Free throw shooting: 11 of 17 for 65 percent. Three-point field goals: Ke. Burns, R. Moberly, Grover. https://www.recordherald.com/wp-content/uploads/sites/27/2017/01/web1_Tabby-Woods-vs-Hillsboro.jpgWashington sophomore Tabby Woods takes the ball to the basket during an SCOL game against Hillsboro at Washington High School Wednesday, Jan. 25, 2017.